So today was a good day! I was featured as a guest artist on Nail It Mag for this mani! 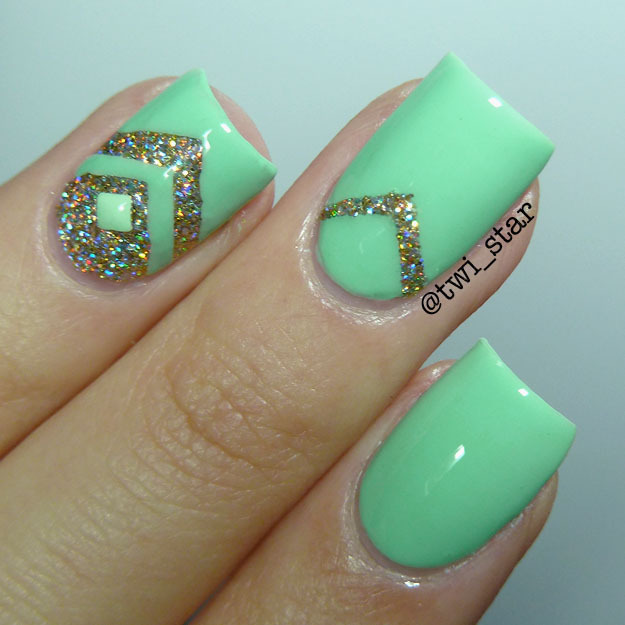 They created an awesome tutorial for it - Nail Art Tutorial: Teal Chevron and Glitter. Now that I'm recovered lol I can post some pics! Lucky Lacquer. 2 perfect creamy coats to opaque, and it went on like a dream. DIFFERENT dimension. It is so sparkly and would make an amazing holiday mani, this one will get so much use! Vinyl It Up, I love nail vinyls they are so easy to use but add so much to a mani! The stud is a 2 mm neon from ebay, there's like 5 billion listings for those so I want link them.